The Aril Society International is a group of iris enthusiasts from around the world that are devoted to promoting the aril and arilbred irises. Because arils originate from arid geographical areas, they tend to go completely dormant in the summer, losing all their leaves. During this dormant period, they cannot tolerate much water. Moisture at this time can cause the dormant plants to rot. They are not, however, especially susceptible to winter cold. They are as hardy as the more common tall bearded irises. The regelias (and aril hybrids with a fair amount of regelia ancestry) are more adaptable than the oncocyclus irises, and are less likely to rot during their summer dormancy. Although arils are difficult, gardeners living in the southwestern US or similar climate should have some degree of success without much extra trouble. In climates that are not so dry (20 inches of rain per year or more), considerable amounts of both labor and luck will be needed. For all arils, sharp drainage is the prime requisite for successful culture. They are desert plants, so they need full sun for at least two-thirds of the day. If possible, some protection from cold and wind is helpful. Washed brick sand, granite, ground pumice, lava, or other coarse material, can be worked into the soil to improve drainage. There should be a good supply of calcium. (Gypsum can be used to provide calcium and loosen heavy soil.) If the soil is acid, lime should be added. Planting the irises on hills or ridges can help the drainage in marginal soils. Many people plant arils in raised beds where sharp drainage can be "built in." In northern areas, planting should be completed by early September. In southern areas, it is advisable to wait a little longer. The idea is to encourage root growth with a minimum of leaf growth, especially in the north. Water well after planting, unless it is very hot, in which case it is best to wait a week or so. Keep them moist until frost. In dry areas where the soil does not freeze, water occasionally during the winter. In areas of extreme cold, a winter mulch can be used, but it should be a material that does not hold water, and should be removed before spring growth begins. Resume normal watering in the spring, and do not let the plants dry out until several weeks after bloom. At this time, withhold water completely and allow the plants to go dormant. Start watering again as new growth emerges in the fall. In some humid areas, it may be advisable to lift the rhizomes when they go dormant, disinfect them, and store them in dry sand or vermiculite until fall planting time. Another way to protect arils from summer moisture is to erect a rain cover over the bed, being sure that there are no "walls" and that there is plenty of air circulation at ground level. Much more information about aril culture is available in back issues of the Aril Society Yearbook. Although the arilbreds are much more adaptable than their aril ancestors, they can still be difficult in climates where summers are wet or cool. Generally speaking, the arilbreds with less than half aril ancestry can be grown the same as bearded irises with a good expectation of success. Conversely, some of those with more than half aril ancestry may actually need to be grown like the pure arils. 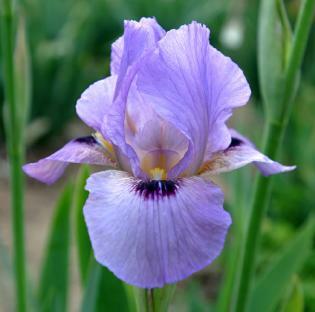 All arilbreds are suitable for xeriscape gardening, as they have much less need for water (especially in the summer months) than do bearded irises. Modern arilbreds of half aril ancestry (the OGB class, chiefly) are the most commonly grown and are not difficult in most climates. 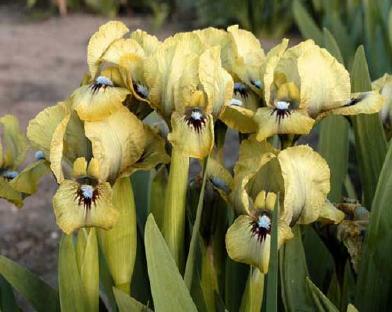 Treat them like bearded irises, but take extra care to see that they have good drainage and do not get too wet in the summer. They do not go dormant like the arils, but they are still somewhat more susceptible to summer rot than their bearded relatives. The conditions they enjoy can often be provided by something as simple as planting on high ground, or in a corner of the bed that gets a little less water. In recent years, more OGB+ type arilbreds (more than half aril) have been produced that are as easy to grow as the OGB types. If you can grow OGBs successfully, it is worth experimenting with a selection of OGB+ arilbreds: many will probably do well. In areas where the soil is acid, lime should be added. Gypsum is also recommended as a soil amendment. Planting on ridges or hills improves drainage. 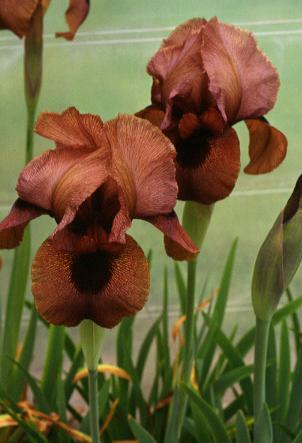 Arilbreds usually need more frequent division than bearded irises. They tend to produce rampant, crowded growth. Division every other year is recommended. They should be divided about two or three months after blooming (July or August in most areas). 'In King's Palaces' photo (top right) by Dolores Bates. Sdlg. ‘AB+00-1’ photo (mid left) by Harald Mathes. 'Babylon Prince' photo (mid right) by Lowell Baumunk. 'Bakhshish' photo (lower right) by Lawrence Ransom. 'Persian Sapphire' photo (lower left) by Lowel Baumunk. Copyright © 1996-2019 Aril Society International. Created April 25, 1996 by Tom Tadfor Little. Updated 2019 March 15 by Ted Havelka.